Marcus Atkinson, of Australia, is touring the U.S. promoting a film opposing uranium mining in his country and heard about the White Mesa protest. “We would like to use this case in our next film to raise international awareness that uranium is too dangerous and is not the answer to our energy needs,” he said. Ute protesters march to Utah uranium mill, Ute Mountain Utes concerned about health impacts from White Mesa mill, The Journal, By Jim Mimiaga Journal Staff Writer May 13, 2017 White Mesa, Utah – About 80 protesters opposed to the White Mesa uranium mill in southeast Utah marched three miles along U.S. Highway 191 to the mill’s entrance Saturday. The protest was organized by members of Ute Mountain Ute tribe, which has a small reservation community three miles from the mill. The mill, which is owned by Energy Fuels, of Toronto, is the only conventional uranium mill operating in the country. They are concerned about the mill’s potential health impacts on air and water quality, and they object to containment cells at the mill that accept radioactive waste from around the country. 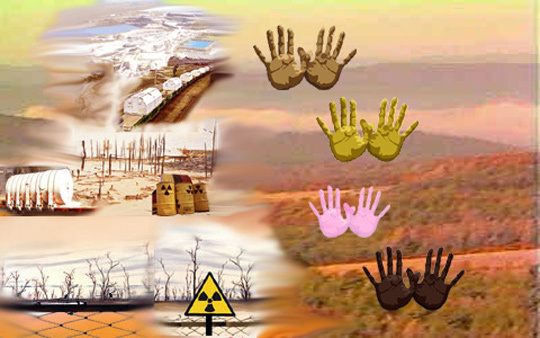 “The dust blowing from uranium ore piles is a concern. Our water comes from wells that are not far from those waste cells. Those things are a big worry for the community,” said Antonio Cly, 22, of the Ute Mountain tribe. He is studying the mill as a student at the University of Utah. Thelma Whiskers, a Ute elder and founder of the White Mesa Concerned Community group, said her family has been fighting the mill all their lives, and the march was a way to raise awareness of the issues to pass on to the younger generation. “We are here, and the fight must continue on to finally shut down this mill,” she said at the rally. Tribal member Ephraim Dutchie said the march was part of a larger movement by Native American tribes to stand up for their rights and protect their lands. “Together we are more powerful, together we will protect Mother Earth,” he said……..
Several environmental groups also attended the rally, including Grand Canyon Trust, which sued Energy Fuels in 2015 for allegedly operating too many waste containment cells than allowed for under Environmental Protection Agency regulations. The case is pending. Bureau of Indian Affairs law enforcement and Ute Mountain tribe security escorted the protesters as they walked along the shoulder of the highway in sunny, windy conditions. Semitrailers slowed down to pass, and cars beeped their horns as passengers pumped their fist in support. At the White Mesa mill entrance, mill staff parked trucks across the driveway in an attempt to prevent the group from walking up to the closed gate 50 yards away.